Total weight gain: Doesn't look like there was a gain this week. Then again, when you're talking about a pound a week, any daily fluctuations can skew the data. Movement: More flutterings. On Thursday night it felt like more intentional flutterings. Like I stopped what I was doing and thought, "Huh, I think that was the baby." Definitely moving during the ultrasound, too. Cravings: I was struggling to make it through work on Thursday afternoon so I drug the laptop into the living room and went through emails while watching Oprah. She had Paula Deen on and she made her Hashbrown Casserole (which I've made in the past). I could have made it right then. I think it may be brunch for Sunday. 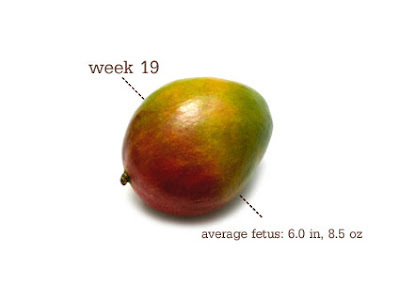 I've also still been eating avocados, which is good since they're high in Vitamin E and I recently read they can help decrease the odds of allergies and asthma in the baby. So I'm still alive. And I've even gotten myself slightly unburied at work. It should (fingers crossed) be a relatively uneventful two weeks there. Woohoo! Total weight gain: Confirmed by the doctor's scale...11 lbs. 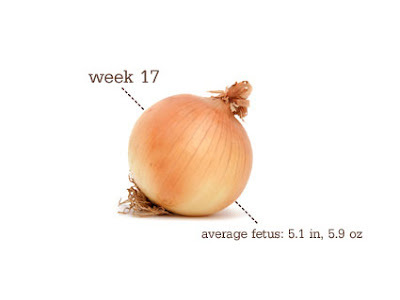 I have a book I read nightly (a pregnancy day-by-day book) and I'm exactly on track according to their little graph. Movement: Same ol' flutterings that I think I'm hallucinating. The PA said I should feel more definite things within the next few weeks. Still looking forward to that. Cravings: I've pretty much cut out caffeine since getting pregnant but I had a little sweet tea this week. It was wonderful. Total weight gain: This morning I was the same weight as last week but I don't believe it. More on that later. Next week, I finally go back to the doctor so I'll have better data. Movement: Still nothing exciting. I know based on what I've read that I'm not behind on this. And first-time pregnant moms usually recognize the feeling later. But, I'm sure anxious for this to start. 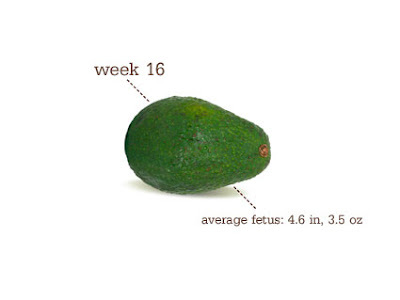 Cravings: I wanted guacamole since last Saturday when the baby was the size of an avocado. Finally got some this week. Thanks, Hubs, for picking up the ingredients. Yesterday was our first anniversary. In some ways (like everything these days) the wedding seems both like forever ago and like last week. We've certainly been through a lot this past year. Moving in together. Taking a few trips. Adopting a dog. 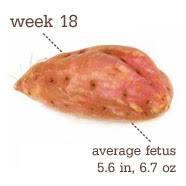 Growing a baby. Yeah, good year. Total weight gain: Yeah, this will still be inaccurate. It appears that I've probably gained another pound or two. Since the weight gain is so gradual, it's hard to tell what's baby and what's just the regular fluctuation throughout the day. Two more weeks till another doctor's appointment so we'll have to wait till then. Movement: Nothing exciting to report. Will be nice (but perhaps a little freaky) once this starts. It's nice to know that everything is ok in there. Cravings: While I have had several good meals, nothing that would meet the craving status. Symptoms: My skin continues to look awful. And headaches. And it seems like I'm getting bigger since fewer of my clothes seem to fit. Oh, and baby brain. (Yes, I forgot to include this earlier and am coming back to add it.) I'm not really liking this part. Please let it be temporary. I'm too young to be senile. I just realized that we were engaged for 9 months before we were married. Married for 9 months before we got pregnant. Hopefully pregnant for 9(ish) months before baby. My life is moving in 9-month periods of time. Strange. Getting married in the summer, I felt, was the perfect time to use sparklers during our getaway. The thing is, a lot of places don't allow you to have a big group of probably drunken folks carrying open flames, often during a draught. When I was meeting with the facilities guy at the university, I decided I wouldn't bring it up. Beg forgiveness instead of asking permission. But because I was in crazy bride mode, I let it slip. He, because he was awesome, let it slide. 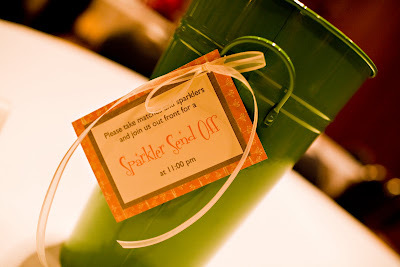 So, no, I don't think we were supposed to have sparklers but no one told us not to.